I have been bothered by my back and neck for months after an injury. The pain used to be so bad that I could not stand up straight or even turn my neck. The pain felt like knives and was so deep and penetrating I was convinced I had a slipped disc . I was looking for anything that I thought may work and grew frustrated by being restricted by the pain. I was loosing sleep to the point I was getting dark circles around my eyes because the pain kept me up at night. OmegaXL has helped to decrease the pain in my back and I am regaining ability to turn my neck with ease . I can now go outside and play with my little sister and my dog . I am able go to work, exercise do yard work go shopping, most of the normal activities I am accustomed to with little restrictions now . I have regained flexibility and motion. 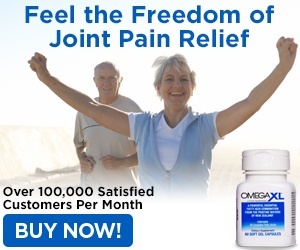 This has helped me more than anything else I've tried and I wish id known about omega XL before making all those costly trips to the ER and to the doctor. I used to have to be really careful getting in the bed, bathtub even riding in a car hurt me because I could not stand the pain caused by being so much as even tilted the wrong way. I've come such a long Way and expect to only get better and better. I am no fan of taking medicine so the fact that this is all Natural and not a narcotic is even better. Review #1008086 is a subjective opinion of jwooten97.